Tomales cartoonist Kathryn LeMieux drew an enthusiastic crowd to Bodega Landmark Gallery in the town of Bodega Saturday when she opened a two-week exhibit of her surrealistic and often-whimsical oil paintings. The final days are this Friday through Monday. 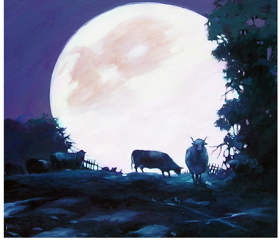 Not surprisingly, two of her favorite subjects — cows (such as Moonrise Over Tomales seen here, copyright K. LeMieux) and the California Mermaids — not only attracted the most attention but also the most buyers. West Marin residents who read Feral West on The Bodega Bay Navigator website or read it for 10 years in The Point Reyes Light are familiar with two of her California Mermaids, Fera with her pet shark Fluffy, and Lana with her cigar and cocktail glass. 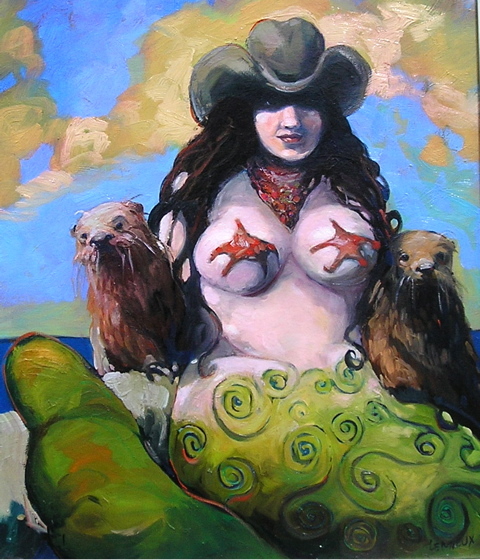 For this exhibit, Kathryn added some unfamiliar and even more voluptuous mermaids, rendering them in a painterly, rather than cartoon, style. 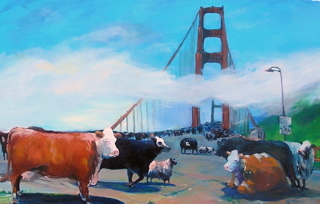 Although Mavis the cow was missing, Kathryn’s paintings of cows jamming the north end of the Golden Gate Bridge (copyright K. LeMieux) and grazing around Point Reyes Station’s old, brick Grandi Building were on display and selling. 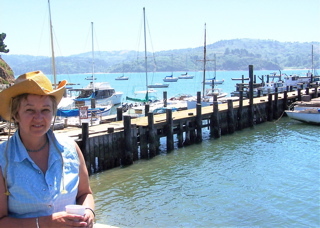 Kathryn claims Mavis the cow is her alter ego in Feral West, but many of us, including her husband Don Armstrong, believe she’s really a California Mermaid — as the photo below, which I took of her at the Marshall Store, would tend to confirm. Kathryn, along with five other women cartoonists, also draws the nationally syndicated cartoon Six Chix for King Features. The strip formerly appeared in The Press Democrat and now appears on SFGate.com if you go to this link. Other websites around the country also buy Six Chix from King Features, which has created a subscriber service “with perks,” Kathryn noted. One of the perquisites is that readers who miss seeing the cartoon in print can have it delivered by email to their computer daily. In addition, they can call up past installments of the cartoon. Since the cartoonists get a cut of what King Features sells, drawing for online readers is becoming an increasingly significant part of their income, Kathryn told me. 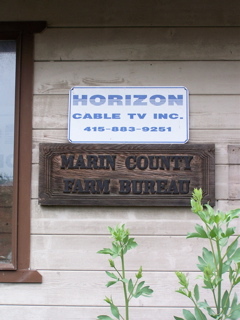 More Internet news: Horizon Cable, which provides television, FM radio, and Internet service to more than 1,200 homes and businesses in Point Reyes Station and Olema, Inverness and Inverness Park, Dillon Beach and Stinson Beach (as well as roughly 375 customers in Novato) has moved its headquarters from Novato to the Farm Bureau building in Point Reyes Station. Like many other Horizon customers, I was without Internet service for extended periods last week, but the outages were not related to the move. Susan Daniels of Fairfax, who with her husband Kevin owns Horizon, on Tuesday told me Horizon is in the midst of a major upgrade. “Every active component in the system will be changed,” she said, explaining this will increase the system’s bandwidth. Along with this will come improved Internet service, high-definition television, and more channels, she added. This being West Marin, however, not everything that recently interrupted Horizon’s Internet service can be blamed on its being upgraded. On Monday night, a PG&E transformer exploded near the Red Barn in Point Reyes Station. Only a handful of nearby customers lost power, but one of them happened to be the Horizon cable system headquartered next door. It was down for several hours. Indeed, there has always been a wild-west aspect to providing West Marin with a cable system. The original system, West Marin Cable, was created strictly to improve television reception. John Robbins, then of Inverness, began the system in 1983 and sold it to Kevin and Susan in 1991. John’s was not an entirely conventional system. Creating a viable cable system for such sparsely populated towns as West Marin’s was daunting. Sometimes John had to string cable on power poles for more than a mile to reach just one ranch. In awkward locations, John had to string his cable on barbed-wire fences. Horizon Cable office manager Andrea Clark fields the calls when customers need help. Her motherly manner makes it difficult for most of us, even when frustrated, to get annoyed with her. 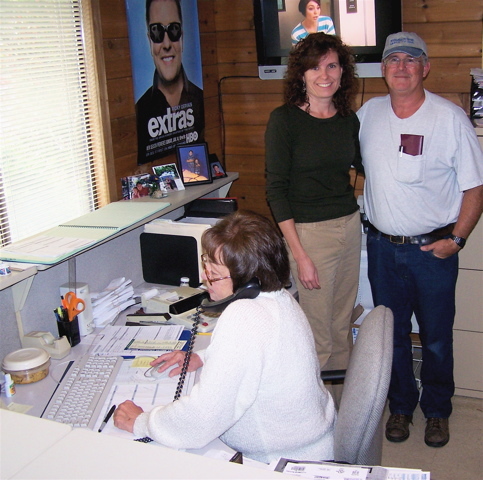 Owner Susan Daniels and system technician Jim Townsend standing behind behind Andrea say major improvements to Horizon’s television and Internet services are being implemented now that the company has relocated its office to Point Reyes Station in the center of its service area. John had been building the Stinson Beach part of his system when he sold West Marin Cable to Horizon. As it happened, county supervisors had issued John a cable franchise for Stinson Beach, but Seadrift subdivision developer Don Beacock had his own deal with Wonder Cable, which at the time served Bolinas. Horizon had no sooner taken over the system when something like the Oklahoma Land Rush began on Seadrift Spit. Within the subdivision, cables had to be buried. Both Horizon and Wonder showed up with trenching equipment, and “it was a race for the spit,” Susan recalled, with each company trying to lay claim to the land first. With two cable companies digging parallel trenches on opposite sides of Seadrift’s roads, county supervisors intervened and ruled that Horizon’s franchise for Stinson Beach was communitywide. That sort of cable conflict, however, pales in comparison to what is currently happening in the former Soviet Republic of Estonia. As Britain’s Economist explains, “For a small, high-tech country such as Estonia, the Internet is vital. But for the past two weeks, Estonia’s state websites (and some private ones) have been hit by ‘denial of service’ attacks, in which a target site is bombarded with so many bogus requests for information that it crashes. “The Internet warfare broke out … amid a furious row between Estonia and Russia over the removal of a Soviet war monument from the centre of the capital, Tallinn, to a military cemetery. The attack, which is sabotaging Estonia’s Internet commerce, as well as government operations, was initially launched by computers traceable to the government of (Ras? 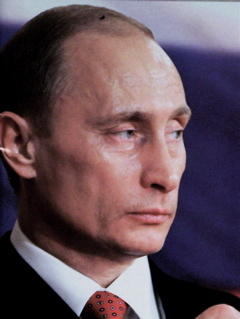 )Putin (seen here in an Economist photo). But the assault has now been taken over by sympathetic supporters, some of whom plant viruses in other people’s computers so that innocent users unknowingly help sabotage Estonian institutions. The assault would be called an “act of war” if carried out with a missile instead with computers, one senior NATO official told The Economist. NATO and the US have rushed observers to Estonia to figure out how a country can fend off such an attack. In the meantime, “the best defence is to have strong networks of servers in many countries,” a Finnish expert is quoted as saying. Sparsely Sage and Timely is powered by	WordPress 4.9.10 and delivered to you in 1.140 seconds using 55 queries.